Universal brackets mount horizontally or vertically and lock in desired angle. 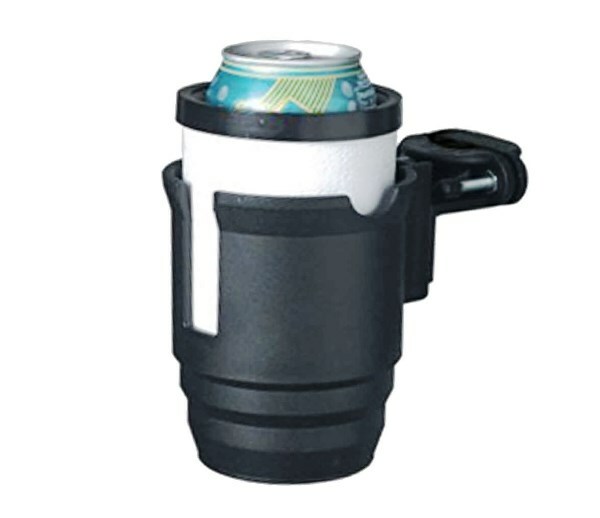 The Universal Beverage Holder is a handy drink holder for cups, cans, mugs, and bottles. 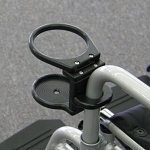 Mobility aid users will find this versatile cup holder has a unique mounting system for horizontal or vertical tubing. The Universal Beverage Holder accommodates beverage containers from 10 to 32 oz., including hot or cold drinks in cups, mugs, cans or bottles. The durable holder is made from high impact polypropylene, and the brackets are made from ultra high impact ABS. 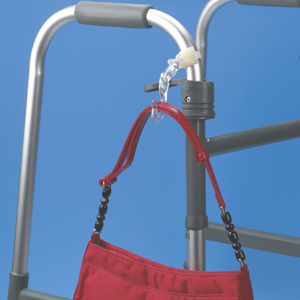 The mounting system allows users to attach the holder to vertical or horizontal tubing, and lock the holder in the best position for easy access. The holder attaches to tubing 7/8 to 1-1/2 inches in diameter, and requires a screwdriver for installation. The holder measures 4-3/4 inches high, 3-1/2 inches wide without the insert, 6 inches high, 3 inches wide with insert. 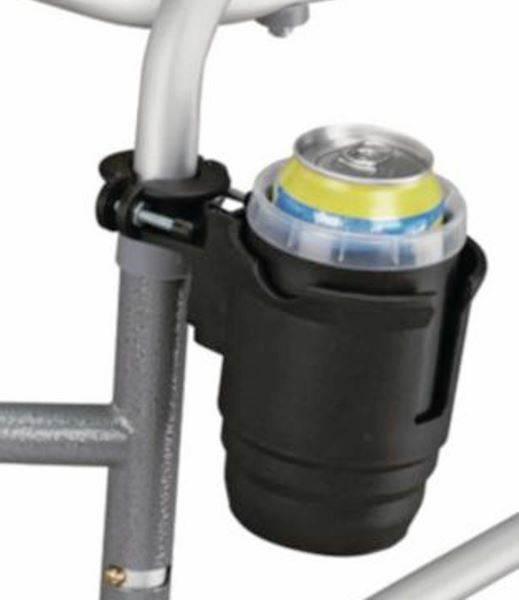 The Universal Beverage Holder provides a helpful solution for walker, wheelchair, rollator, and scooter users to easily carry beverages while using a mobility aid. Holds: 10 ounce to 32 ounce cans, cups, bottles, and travel mugs. Measures: 4-3/4 inches high, 3-1/2 inches wide without insert, 6 inches high, 3 inches wide with insert. Fits: Horizontal or vertical tubing 7/8 to 1-1/2 inches in diameter. Materials: High impact polypropylene, ultra high impact ABS brackets. I bought this item to take my coffee from the kitchen to my resting spot. Does not attach anywhere onto the wheelchair, at least my model. There is not enough metal tubing to attach. 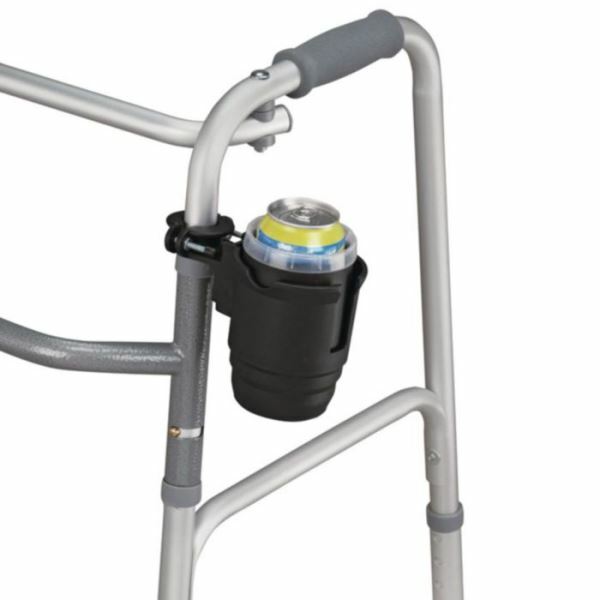 I attached it to my walker and it is the best. Q: Can this be put on a powerchair? A: So long as the tubing where you intend to mount the cup holder is between 7/8 to 1 1/2 inches, yes, you could mount it to a powerchair.